Area of Ormos Koumeikon (or Balos) settlement, located at the south of the island. 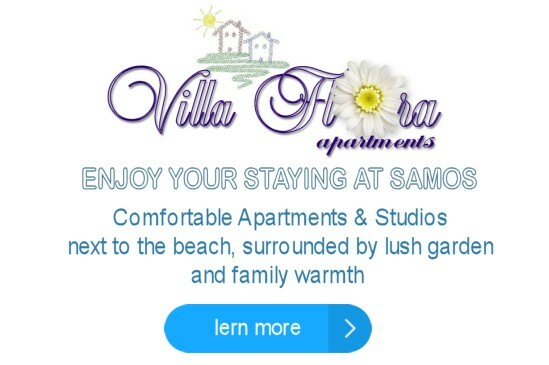 It’s a known tourist resort in Samos, with beautiful natural beauty. Population is 45.
it is a beautiful, secluded beach in the nature, with sand and partly pebbles. Access is relatively difficult, but will reward you when you are explorer and looking for the isolation and quiet away from the crowds and organized beaches. It is a sandy, small, picturesque beach with crystal clear turquoise waters and an exotic character. 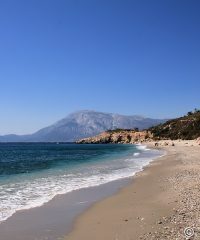 Located in the small island “Samiopoula” (surface 1 Km2), south of Samos and is accessible only by boat. Almost daily, organized excursions by boat from the port of Pythagorion to the beach. The aim of the project was to supply water from the source of “Ayades”, (hidden at the mountain away from enemies), to the ancient city of Samos, through mount “Kastron”. The result was a remarkable water pipeline, total length 2,385 meters, of which 1,035 through tunnel.